Can you feel it? Christmas is coming!! Admittedly, my excitement for Christmas starts a tad early. I usually blame it on the fact that I hand make a bunch of our gifts and it just takes me longer to get ready. However, I can't really excuse starting a Christmas gift idea list in March. Can gift giving be an obsession? On the list this year for my son and nephew (both under 2) are rainbow plush alphabets with a little bag to keep them corralled. After creating a patterned fabric letter version previously, I wanted to try a solid rainbow version. I'm thrilled with how they turned out. 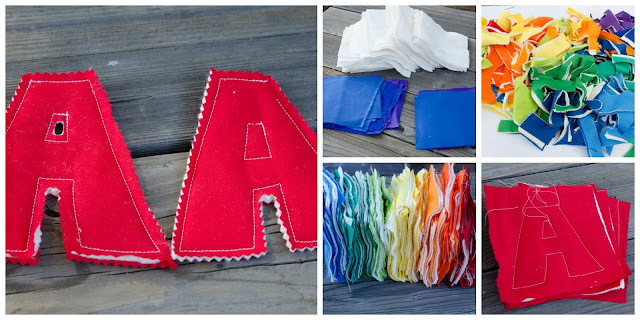 And bonus...they can be used to teach colors, ROYGBIV, and the alphabet! I promise not all my son's gifts are educational :). If you are new to sewing, have no fear - these are a piece of cake to make with only basic sewing knowledge. 2. Cut 4 6" x 6" squares per material color for a total of 52 squares. The squares do not have to be perfect or exactly the same so don't waste your time here. I just do this to help ensure that all the letters are roughly the same size at the end. 3. Cut 52 6" x 6" cotton batting squares. 4. Order your squares in color progression of the rainbow (ROYGBIV). 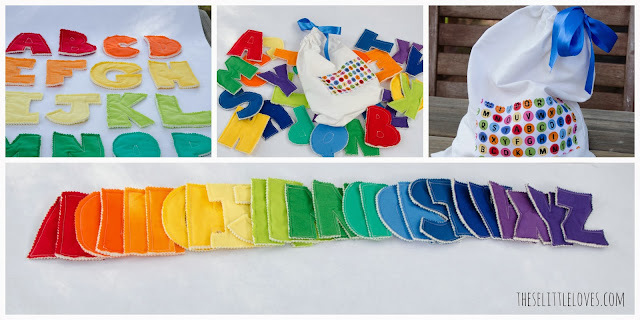 Of the 52 squares, take 2 of each color and sketch (or stencil) chunky letters very lightly in pencil (I used a dressmaker's marking pencil which works particularly well on the darker fabrics). Your first color should be a red. Take two red squares and write an A on one and a B on the next. Your next color is likely an orangey red...write a C and D on two of these squares. Etc. I like to draw mine by hand - I think it gives them a playful, not perfect feel. Ensure there is at least a half inch buffer around all edges of the letters. 5. Sandwich two batting squares between two matching color squares. Ensure the square with the drawn letter is on top. You might want to pin through all four layers to prevent puckering or slipping. I apparently cannot use pins without pricking every single finger, so I went without and it worked fine as long as I was careful. 6. 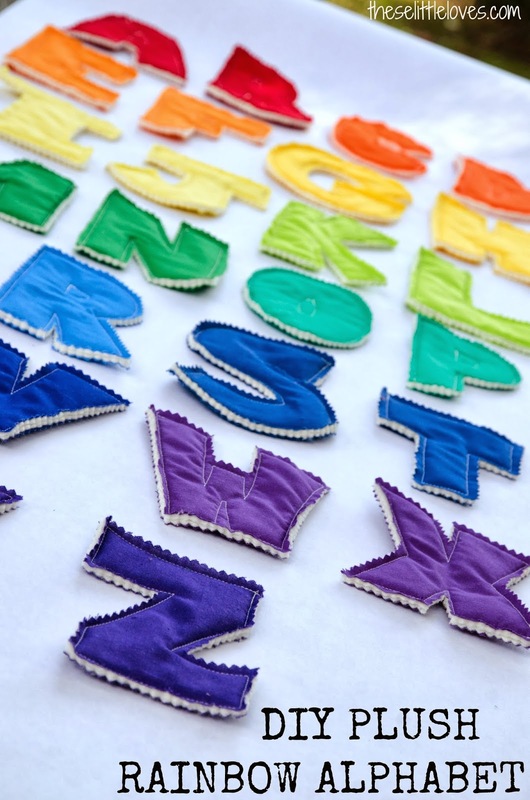 Use your sewing machine to stitch along the letter outline (be sure to backstitch at the beginning and end). Remove any visible stray marks. 6. Cut around the outside of the letter with the pinking shears. Don't get too close to the stitches - you want a little buffer here. You can also use fray check along the edge of the letters if you want to further prevent fraying. I don't use fray check because I figure these will go in my son's mouth at some point. 7. For the inside of the letters (like the middle of an A), you can either cut or leave solid. Use normal scissors if you do choose to cut (not pinking shears). 1. Iron the fabric chosen for the bag and cut a 24" x 16" rectangle. Choose one of the 24" sides as the 'top edge' of the bag. The 16" edges will be referred to as the 'side edges'. 2. On right side of the fabric near the 'top edge' of the bag, mark a 3/4" long button hole starting 1.25" from the 'top edge' and 3/4" from one of the 'side edges'. Mark an identical button hole near the other 'side edge' of the bag 1.25" from the 'top edge' and 3/4" from the 'side edge'. 3. Sew the button holes using a small piece of the same fabric as interfacing. If you don't have an automatic button hole foot on your machine, I highly recommend it! A Button Hole Cutter also comes in handy to open up the hole, but scissors can be used also. 4. Turn the material wrong side up and fold the top edge of the bag down so the edge extends below the bottom of the button hole approximately 1/4" - 1/2". Seam below the button holes. 5. Fold the bag right sides together such that the 'side edges' come together. Seam along the side edge and bottom edge of the bag, backstitching at both ends. Turn the bag right side out. 6. 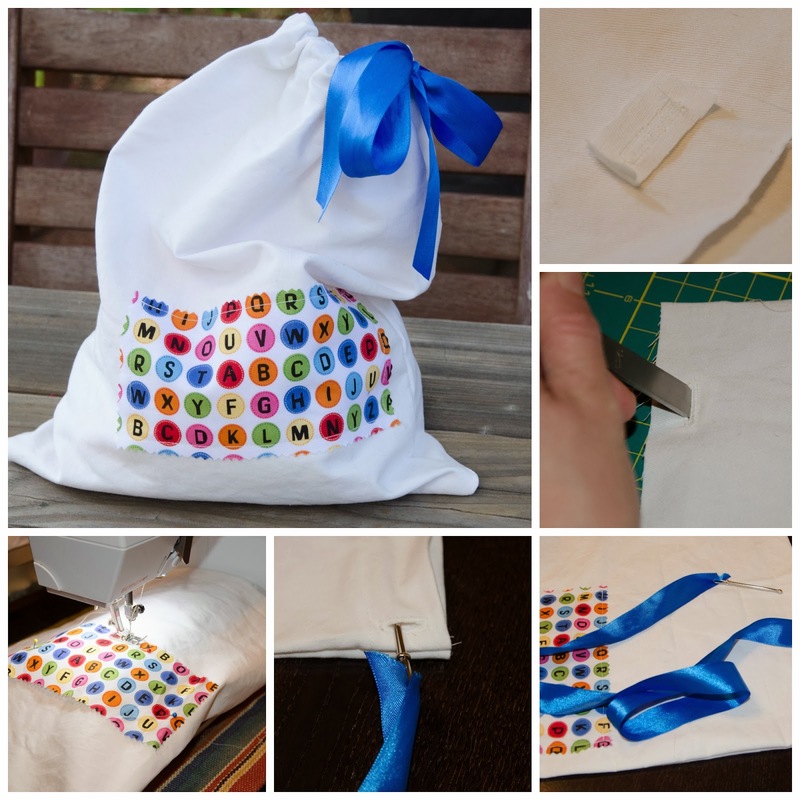 Attach a bodkin to one edge of ribbon and thread through the bag, button hole to button hole. 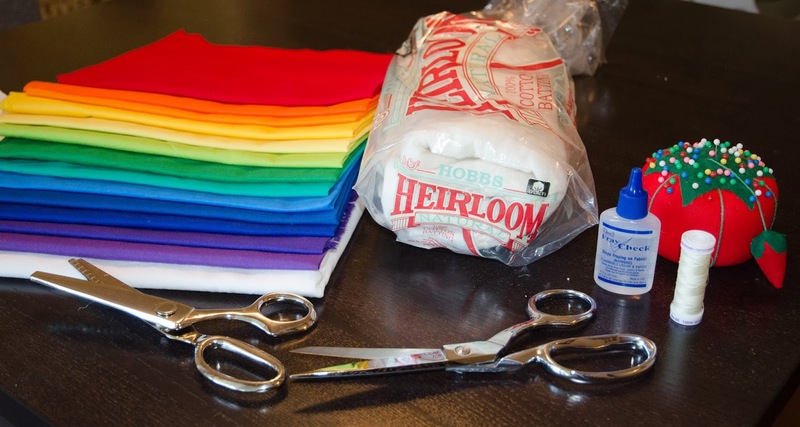 Trim the ribbon edges and use fray check to prevent fraying. 7. To dress up the bag a bit, I cut a rectangle of alphabet fabric with pinking shears and sewed it onto the front of the bag.